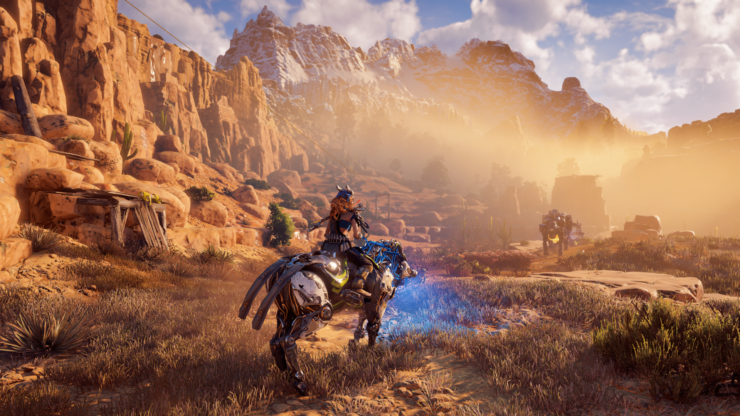 Guerrilla Games’ managing director, Hermen Hulst, has denied recent reports about a huge Horizon Zero Dawn day-one patch. The update will approximately weigh in at only 250MB. Last week we reported on Zero Dawn’s street date being broken way ahead of its official release by the end of this month. It seems copies of the game appeared in the wild, and recent rumors claimed that the action-RPG would receive a rather huge day-one patch of roughly 16GB. Following these reports we reached out to Guerrilla Games to verify whether these reports were valid. “This is very incorrect information”, the studio’s managing director replied. While Zero Dawn will receive an update on day-one, it will only be around 250MB according to Guerrilla Games. “For those interested, #HorizonZeroDawn will receive a day one patch of around 250MB”, the studio’s official Twitter account tweeted.For those interested, #HorizonZeroDawn will receive a day one patch of around 250MB. The 16GB download size that has been mentioned in earlier reports, probably refers to the game’s install before people can start playing while the rest of the game is being installed. Horizon Zero Dawn is scheduled for a release on February 28 exclusively for PlayStation 4.